Trinity RV Rentals wants to be “Your Speedway RV Rental Specialist.” We offer “All Inclusive” Speedway race packages from start to finish. 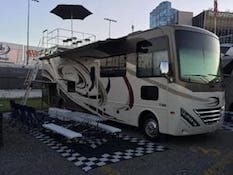 We drive the Motorhome of your choice to the Speedway property, perform all of your set-up and take-down functions, and provide all your overnight amenities to include fresh bedding, towels, pillows and blankets. 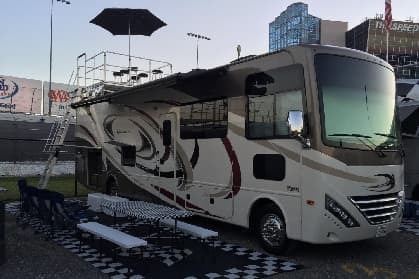 We develop our RV rental packages to include all diesel fuel usage, generator usage, LP gas, chairs,tables, a commercial gas grill, cooking utensils, patio carpet and all your necessary TV & electronics to make you feel right at home. There are no hidden fees to be concerned about! We only ask that you purchase your own infield tickets, food and drinks, and any additional sanitation cleanouts that my be necessary. We are perfect for fly-in & fly-out guest. Our complete “turnkey” approach will leave just about all your rental details for us. Our All Inclusive Speedway race packages also include your infield site. We have premium infield and wall sites available at most major speedways. 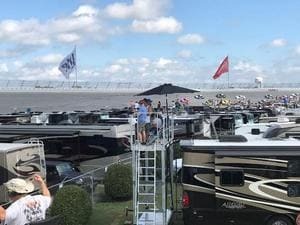 Our infield sites are on the wall or fence for the best possible view of cars and drivers. 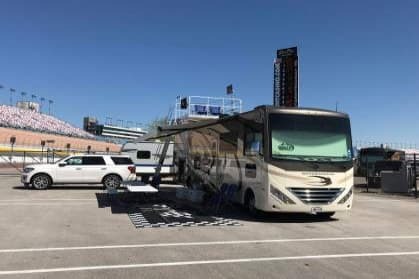 Call us today at 1-800-917-7511 and allow us to be your 2019 Speedway RV Rental Specialist! FEW PACKAGES LEFT RESERVE NOW! why customers choose trinity rv rentals? trinity rV rentals is leading the Industry in innovation. we are constantly asking ourselves how can we make the racing experience better for the customer? 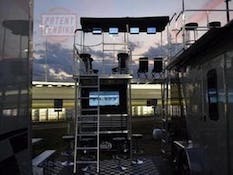 We have added very unique custom viewing decks attached to the roof of many of our motorhomes and trailers. we have Acquired patents from the united states government on our skybox entertainment systems, and have a patent pending for our skyview observations systems. both inventions give race fans a form of entertainment in the infield, and a way to view and experience a race like never before! rent these new exciting concepts Individually or as one of our unique rental packages today! at trinity RV rentals we take pride in our customer service! 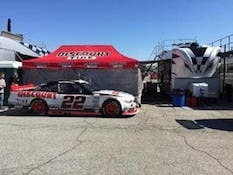 we stay in the infield at most major speedways so we can give the customer the service they deserve. Whether it is filling up fresh water, fixing minor issues , fueling generators, fixing satellite tV, we are there to make sure your issues are addressed. unlike other rental companies who simply drop and go, we are always a call away! let us give you the service you deserve so you can enjoy the race like never before. check out some of our most recent feedback below that was recently left on our facebook page to see what customers are saying! "Thanks to Roger, Aaron and Sam for the trip of a lifetime! Their professionalism and customer service are second to none. Trinity RV Rentals did not disappoint. We'll see you again!" "Had the trip of a lifetime!!! Trinity RV Rentals are the best. Awesome set-up and service. Thank you Roger, Aaron and Sammy for a great Daytona 500 experience. These guys are the BEST !!!" "Best time ever at Talladega. The location and RV were fantastic as well as the team who made sure everything was running smoothly. Perfect bucket list experience and I will use Trinity RV Rentals again!" "Thanks for a great Daytona 500! Trinity is the best and every little detail was done perfectly. They are very responsive and on-site for anything you need. Cant wait to do it again." ALL PRICING INFORMATION, PICTURES, AND LOGOS CONTAINED ON THIS SITE ARE COPYRIGHT OF © 2019 TRINITY RV RENTALS, LLC. ALL RIGHTS RESERVED.